Many thanks Heresylabs I searched for kompare windows and was plesantly surprised to see your posting. Scary numbers of files are downloaded and installed as part of KDE but its all worth it to have kompare. NB I did have to reboot before kompare started working. Many, many thanks. 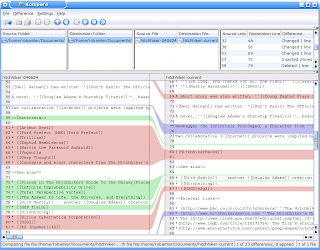 Winmerge can be configured to work very well, but not as good as Kompare. Kompare makes it worth installing KDE for Win, but they do not have your descriptive tutorial for setting up the diff app. I almost uninstalled it until I found your page. I am trying to install Kompare for Windows. I downloaded kdewin installer and run it. But the in which mode (user or package manager) I have to run the kdewin installer ?? which package I have to install to install Kompare? I cannot see Kompare in the list of program. Thanks to pont me to the steps. The kdesdk package is sufficient to get Kompare. Awesomeness. Can't believe how long I've gone without Kompare. Thanks for the guide. I gave up on Winmerge2011 after too many failures and wanted to try Kompare -- thanks to your guide I could install it and now have a good file comparison tool.